A grisly homicide, an international threat. The stakes have never been higher for Roland March. In 2010’s Back on Murder, J. Mark Bertrand introduced us to Roland March, a tough homicide detective in the city of Houston who was charged with investigating a deadly shooting and eventually tracking down a missing girl. In Pattern of Wounds, March went on the hunt for a serial killer who stabbed their victims repeatedly. In Nothing to Hide, March faces a brutal murder– the corpse decapitated and degloved. This leads him to a gunrunning operation involving drug cartels, the feds, and many others. It seems that with each installment of the series, Mark becomes more and more ambitious with his storytelling. This ambition has payed off every time– especially with Nothing to Hide. In this book, we got everything we could ask for. Murder, conspiracy, and FBI. What is a mystery series without a run-in with the latter, yes? Mark weaves a tight tale that keeps the reader engaged from the first chapter which challenges March physically and spiritually. The reader will be kept guessing throughout the story how everything connects with the murder and even March’s past. Along with great story lines, Mark excels at character development, especially when it comes to March. As with the first two books, the whole thing is in the first person viewpoint of March. This gives the reader an excellent opportunity to fully understand March and the challenges he faces about the case and himself. While the book is categorized as Christian fiction, there is very little “Christianity” in it. There is no preaching. However, March does come face-to-face with his spiritual issues now and then. More likely what makes the book Christian fiction is the lack of excessive violence (for the most part) and the absence of profanity. The word “whore” does come up twice, but I did not have a problem with it. 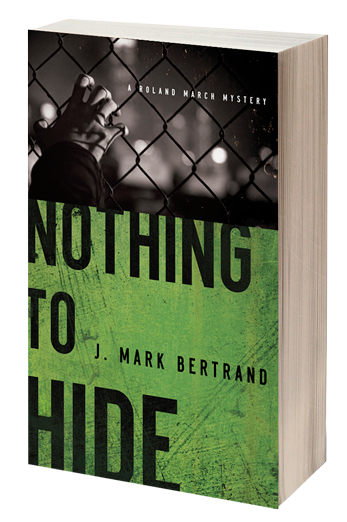 Nothing to Hide is reportedly the last book featuring Roland March as the contract with Mark’s publisher was for three books, so the novel does provide a satisfactory ending if there really will be no more. However, Mark did leave plenty of things open to be able to give readers more of this awesome series and its intriguing protagonist, Roland March. Note: I received a copy of this book in exchange for review from the publisher. All thoughts and opinions are mine.